Thorburn Flex Inc provides rubber & metallic hose assemblies for catenary, fueling machine, D2O primary & auxiliary transfer service meeting the requirements for ASME Section III Class 1, 2, 3 & Class 6. 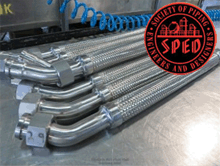 Thorburn Flex designs and manufactures custom metallic expansion joints for main steam penetration, spent fuel bay interconnecting piping, crossover, steam lines, boiler feed pumps & treated water lines, meeting requirements for ASME Sec III Class 1, 2, 3 & 6. 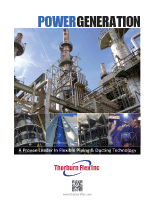 Thorburn Flex designs & manufactures rubber expansion joints for raw service water, circulating water cooling and circulating water service piping critical to the operation of a nuclear reactor, meeting requirements for ASME Section III Class 6. 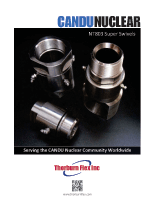 Thorburn Flex designs and manufactures Metallic Bellows for the fuelling channel annulus seals, reactivity mechanisms, penetration seals, heat exchangers in nuclear reactors, meeting requirements for ASME Sec III Class 1, 2, 3 & 6. Thorburn Flex designs and manufactures valved and non-valved quick couplings for nuclear fueling machines, D2O primary & auxiliary systems and core feeder systems, meeting requirements for ASME Section III Class 2, 3 & 6. N71 couplings are perfect for use where space is limited and are designed for high pressure applications. Thorburn Flex designs and manufactures non-valved quick couplings for liquid nitrogen service in radioactive environments, meeting requirements for ASME Section III/CSA N285.0 Classes 1, 2, 3 & 6. Thorburn Flex designs and manufactures valved and non-valved quick couplings for nuclear fueling machines, D2O primary & auxiliary systems and core feeder systems, meeting requirements for ASME Section III Class 2, 3 & 6. Thorburn Flex designs and manufactures Swivel Couplings for nuclear fueling machines, D2O primary & auxiliary systems and core feeder systems, meeting requirements for ASME Section III Class 2, 3 & 6. Met-O-Seal is an all metal sealing quick action coupling specifically designed to replace elastomeric "O" ring quick couplings or flange connectors in applications were leakage is a critical problem. Thorburn Flex designs and manufactures ball valved quick couplings for nuclear fueling machines, D2O primary & auxiliary systems and core feeder systems, meeting requirements for ASME Section III Class 2, 3 & 6. Omega quick couplings are designed for vacuum and low pressure applications. 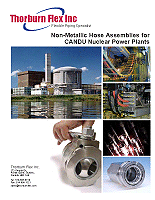 Thorburn Flex designs and manufactures pipe clamp connectors which provide an alternative to pipe flanges and are ideal where space, weight and joint integrity are critical requirements in a nuclear reactor, meeting requirements for ASME Section III Class 1, 2, 3 & 6. Thorburn Flex designs and manufactures custom adapters for D2O discharging and loading transfer, plumb-up of fueling machine, catenary ion exchanger & panametric connections, meeting requirements for ASME Sec III Class 1, 2, 3 & 6.